The end table styles pictured below and on the next three pages can be built and woven for you in the dimensions and colors of your choice. Tina welcomes commissions to custom build and custom weave furniture. Contact Tina directly to commission a custom-designed end table. 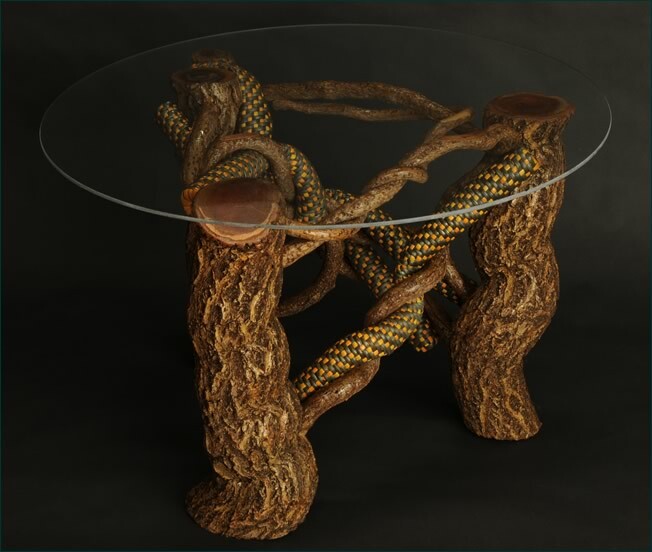 H 20" W 25" D 25"
Tina took one of the thickest pieces of bittersweet vine she has ever seen to make the three legs of this striking end table. Attached to the legs of this unique piece of furniture are twisted vines of bittersweet and tubes Tina has woven from reeds she dyed in the colors of dark green and yellow. The table's glass top is a 32" circle. The table's price does not include the glass. View another side of this triangularly-constructed table. View the the third side of the triangle.